Almost all properties have driveways and these are one of the first things that any visitor to your property notices. The driveway also sees considerable wear and tear from foot and vehicular traffic and has to endure things like oil stains from stationary vehicles etc. this makes it crucial to use very hardy, weather-resistant and tough materials in driveway construction. We at Rou Pavers are one of the leading companies in the hardscaping space and have created a distinct niche for ourselves in the industry. 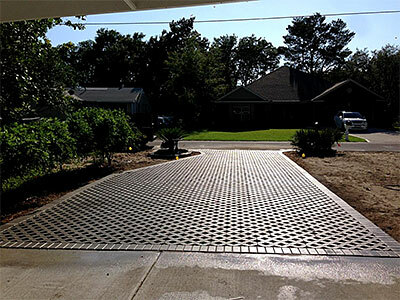 Our company has handled significant number of driveways installation projects for clients in and around Pensacola, Golf Breeze, Pace, and Milton. Our experts have designed and constructed impressive residential driveways on properties in Navarre, Navarre Beach, as well as Pensacola Beach. We are ICPI-certified installers and clients from across Fort Walton Beach, Baldwin County and the surrounding areas trust only us for all their hardscaping requirements. Variety - As mentioned earlier, you can choose from concrete, brick or natural stone pavers. All of these are available in a variety of shapes, colors, designs and sizes. This gives you the design flexibility to create the type of driveway you want. Easy Installation - Paver units are placed on compacted sand and the installation is quick. We have the expertise and knowledge required to handle these jobs professionally and install the edging as required. Low Maintenance - Outdoor pavers are very easy to maintain. They only need to be pressure-cleaned once in a while and you can get them seal-coated once every two years. This helps protect them from wear and stains. Durability - When you are getting any outdoor feature installed; you want to ensure it is durable and will last for a number of years. Regardless of whether you opt for natural stone, concrete or brick pavers, they can last for decades with just the basic amount of maintenance. Cost-Effective - Last but not the least, pavers are very cost-effective. Interlocking Concrete pavers are the most economical while brick and stone ones are priced a little higher. But these too provide excellent value in the long term. When you hire us for paver driveway design and installation, you can rest assured that the best workmanship and materials are used in the work. This ensures the aesthetics, functionality and longevity of the features. If you are looking for driveway installation contractors that will cater to your specific needs and give form to your ideas, we are the company to come to. For any more information on our services and paver driveway cost, feel free to contact Rou Pavers at 850-791-5641. You can send us your project details via this Contact Us form or request a free estimate and one of our experts will get in touch with you shortly.